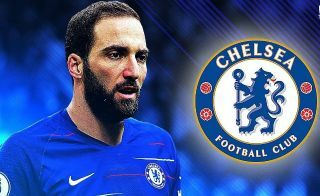 Chelsea are reportedly trying to finalise the Gonzalo Higuain transfer as quickly as possible so manager Maurizio Sarri can give the striker his debut against Arsenal at the weekend. The Blues travel to take on the Gunners at the Emirates Stadium in Saturday’s late Premier League kick-off, and could definitely do with having this signing wrapped up by then. The Evening Standard report that Chelsea want to be able to include Higuain in that game, so are working to get everything over the line before then. The outcome of the game could undoubtedly hinge on whether or not Sarri can start with a player of the Argentine’s quality up front this weekend, or if he’s forced to use Alvaro Morata, Olivier Giroud or even Eden Hazard as his striker. CFC fans will hope their club can speed things up over the next couple of days, while Arsenal fans will no doubt be hoping the deal hits a snag. Given the recent form of Unai Emery’s side’s defence, they could really do without coming up against a striker as good as Higuain. The 31-year-old has been one of Europe’s most prolific front-men in recent years, though he has not up til now tested himself in the Premier League.